Tonight's GFS and NAM have very light showers during the morning, ending about 2 PM or so. Amounts of rain have declined each model run. Total QPF is only about 0.10 inches water. Clouds may break for later in the afternoon. Sat 4/1: Cloudy with very light showers in the morning ending about 2 PM. Clouds gradually lift in the late afternoon with some sun late. Breezy. High 67. Sun 4/2: Sunny and continued mild. High near 62. Low pressure moves through to our north on Saturday, with a frontal boundary passing through Philadelphia about 2PM. Showers accompany the frontal passage. Both the WRF (Weather Research Forecast Model) and the GFS show about 0.20 inches water falling as rain, from before daybreak to about 2 PM. Heaviest showers expected about 1 PM. Sat 4/1: Cloudy with showers in the morning and a heavier shower about 1 PM. Clouds gradually lift in the late afternoon with some sun late. Breezy. High 67. Low pressure moves through to our north on Saturday. The timing of the precipitation on Saturday has changed again, with the GFS showing showers in the morning and a chance of a brief thundershower in the afternoon. Sat 4/1: Cloudy with light showers in the morning. Brightening skies mid-day, but there remains a chance of a shower/thundershower through the afternoon. WINDY. High 67. Sun 4/2: Mostly sunny and mild. Still breezy. High near 67. The amount of rain being forecast for Saturday has diminished considerably over the past day. Additionally, much of the rain may be over before noon on Saturday. Sat 4/1: Cloudy with lingering light showers in the morning. The sun breaks through in the afternoon. WINDY. High 67. Mostly cloudy today, as a weak disturbance comes at us from the west, acting as a warm front. Very light showers possible tonight. QPF values are about 0.05 inches water. Milder temperatures follow for the next few days. A large low pressure system will develop in the middle of the country and will reach us on Saturday. The models have been consistent with rain Saturday and sunny on Sunday. Sat 4/1: Cloudy with rain/showers, mostly before 1 PM. Remaining cloudy. Current QPF values are about 0.25 inches water. High in the 50s. Sun 4/2: Mostly sunny and mild. High near 60. After a sunny day on Monday, clouds will move in on Tuesday with showers late or at night. Milder temperatures are expected for the balance of the week, although today's extended GFS model (GFSX) has high tempertures in the mid 60s instead of 70. The GFSX continues predicting rain for the coming Saturday. This week will be a transistional week, where the persistent cold flow will recede into Canada, allowing near 70 degree temperatures to be reached on Thursday and Friday. Before that time, a weak disturbance will give us showers Tuesday night. Unfortunately, the current GFS has rain for the coming Saturday. These storms have been predicted in the long range, only disappear as the weekend approaches. So we'll see if this doesn't disappear as well. The humidity fields continue to lower, but cold air aloft will result in 'self destructive sunshine'. Last night, I felt we'd see the sun by late afternoon. A mix of clouds and some sun, becoming mostly sunny by 5 PM. Warm weather is expected to make a welcome return by Thursday. Sun 3/26: The sun breaks through as the clouds lift during the afternoon. Mostly sunny by 5 PM. This afternoon's models have slow clearing on Sunday. Showers early should end by noon. Brightening skies with clouds dissipating in the afternoon and some sun should be out before sunset. The GFS maintains a possibility of a brief shower in the afternoon; the WRF model has none. Sun 3/26: Showers and damp in the morning. Brightening skies mid day. Sun breaking through during the afternoon, probably late. High near 53. Considerable cloudiness for Saturday as an easterly flow and an upper low pressure system will keep unsettled weather for our area through early Sunday. Current NAM and GFS has light drizzle or showers from noon onwards. With the current level of 0.12 water, it's difficult to tell if the models are overstating the amount of rain. Additionally, the latest models aren't set on full clearing for Sunday. Sat 3/25: Mostly cloudy. Chance of light sprinkle a light shower in the afternoon. Timing of the precip is difficult and may be overforecast by the models. Current QPF values has increased from .07 to over .12 inches inches water. Below seasonable high temps 46. Sun 3/26: Continued cloudy, but with [possible] clearing and sun during the afternoon. High near 52. Considerable cloudiness for Saturday as an easterly flow and an upper low pressure system will keep unsettled weather for our area through early Sunday. A northerly flow of drier air comes in on Sunday and there should be clearing during Sunday afternoon. Sat 3/25: Mostly cloudy. Chance of light sprinkle a light shower in the afternoon. Timing of the precip is difficult. Most of the day rain-free. Current QPF values is .07 inches water. Below seasonable high temps 45-50. Sun 3/26: Continued cloudy, but with clearing and sun during the afternoon. High near 50. The models are suggesting more cloudiness. While much of the day will be rain-free, the GFS has very light precipitation in the early morning and very late afternoon on Saturday. Similar scenario on Sunday. Sat 3/25: Mostly cloudy. Chance of light sprinkle very early and a light shower very late in the afternoon. Timing of the precip is difficult. Most of the day rain-free. Below seasonable high temps 45-50. Sun 3/26: Continued cloudy, perhaps with some breaks of sun. High near 50. Still a chance of a brief sprinkle in the late afternoon. This morning's GFS model (and more pessimistic NAM model) shows an upper low over us for Saturday, resulting in unsettled weather. The models are suggesting more cloudiness and a greater chance of a shower or sprinkle during the day. Much of the day will be rain-free. Sat 3/25: Considerable cloudiness with perhaps some breaks of sun early in the day....Chance of a passing shower or snow flurry. Timing of the precip is difficult, but afternoon is more likely. Below seasonable high temps 45-50. Sun 3/26: More sun likely than Saturday, with a high near 50. Still a chance of a brief sprinkle in the late afternoon. This morning's GFS model has a persistent northwesterly flow of cold air over us into next week. Cold air aloft trapped in an upper closed low and small areas of vorticity (spin) will be brought down with the northwest flow over the weekend, giving us period of clouds, especially in the mid day and afternoon and chances of light shower or even wet snow flurries. Sat 3/25: Sunny in the morning, then considerable cloudiness with perhaps some breaks of sun...Chance of a brief passing shower or snow flurry. Below seasonable high temps 45-50. Sun 3/26: Similar to Saturday, but more sun likely, slightly milder with a high of 50. Still a chance of a brief sprinkle in the late afternoon. This morning's GFS model has a persistent northwesterly flow of cold air over us into next week. Small areas of vorticity (spin) will be brought down with the northwest flow over the weekend, giving us period of clouds with sun and chances of light shower or wet snow flurries. Current MOS forecasts (model output statistics) still predict temps near 50 for the weekend, but the atmospheric thickness levels suggest that temperatures could be colder. Sat 3/25: Sunny with occasional clouds. Chance of a brief passing shower or snow flurry. Below seasonable high temps 45-50. Sun 3/26: Partly sunny/partly cloudy. Temps near 50. Today's low pressure system has weakened so much that we'll only have some clouds in the afternoon. A cold northwesterly flow remains with us through the week and weekend, with occasional upper air disturbances causes some clouds at times. Current MOS forecasts (model output statistics) have temps in the low 50s; I'm wondering if it will get that warm, as the GFS model shows atmospheric thickness levels to be quite low over the weekend. Sat 3/25: Partly to mostly sunny. Below seasonable high temps near 50. The models continue to have the snow stay just south of Philadelphia, with nothing more than a few flurries. The image on the left shows the WRF model output from this afternoon. The WRF model, or Weather Research Forecast model, is being groomed to replace the NAM model. The most snow currently expected here is perhaps a few flurries. A continued cold flow is expected for much of the week. 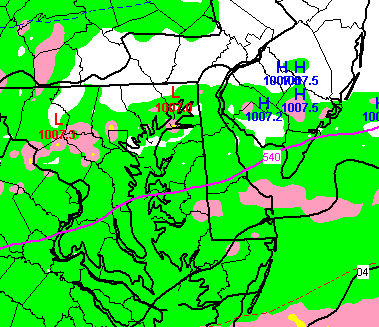 All the models continue to suppress the snow on Tuesday afternoon just to the south of Philadelphia. Areas in Delaware and Cape May may have some accumulation on grassy surfaces. The most currently expected here are perhaps some flurries, just south of the city. A continued cold flow is expected for much of the week. Both the GFS and NAM have the snow to our south on Tuesday. No precipitation expected. Winter is taking its time moving on. A storm approaches from the west on Tuesday, with significant differences between the NAM and GFS models. The GFS suppresses precipitation to our south, while the NAM has a mix of snow and rain over-running the area during Tuesday afternoon. Usually, I lean towards the GFS model, but the GFS Ensemble (statistical array of 12 different variations of the GFS) has a fair amount of overlap with the NAM model. So, this particular forecast is lower confidence than usual. I'll update tomorrow. Low pressure is tracking across the country through Tuesday. Large differences in the models as the NAM has precipitation here but the GFS keeps the storm to our south. Cold air in place may give us another chance at mix of rain and snow on Tuesday, the first full day of Spring. Sun 3/19: Sunny and just a bit less windy. High 46. An ongoing northwesterly flow of cold, dry air will be with us during the weekend. The strong March sun will mix down fast upper level winds, giving us typical March windy conditions for the mid-day hours. A slight warm up on Monday will preceed showers/rain on Tuesday. Sat 3/18: Sunny and becoming windy by noontime. High 45. High pressure builds in this weekend, behind the small clipper disturbance that's exiting to our south today. Windy and cold (for March) conditions are the outlook. A slight warm up on Monday will preceed showers/rain on Tuesday. Sat 3/18: Sunny and windy. High 45. Sun 3/19: Sunny and just a bit less windy. High 48. No precipitation expected for Friday, as the disturbance will pass to our south. (GFS has a 25% chance of a flurry.) Sunny, somewhat cold and windy for the weekend. Sun 3/19: Sunny and Windy. High 47. Both the NAM and GFS models from last night have essentially dropped the snow forecast for Friday morning, with the system moving to our south. Total QPF values range from 0.00 to 0.02. Cold high pressure will build in for the weekend. Windy and sunny will be the simple forecast. Differences, as usual, for the light snow event for Friday. The preferred GFS has 0.14 inches water falling as snow or snow mixed with rain through much of Friday morning. The NAM has 0.00. Taking the average, a light coating to an inch is possible Friday morning with more snow (meaning slightly more) to the south of Philadelphia than to the north. Roadways should be OK, since solar insolation will be high through the clouds on the dark pavement. Sun 3/19: Sunny and Windy. High 48. The cold front moved through before daybreak and cold air has moved in. A strong pressure gradient is expected to produce high winds again tomorrow. Current NAM and GFS models predict about 1 inch of snow Friday morning. Cold temps are expected through much of Saturday. The weekend will be sunny and cold, especially Saturday. The cold front has moved through within the past few hours and colder drier air will filter in during the day on moderately strong winds during the day. A weak disturbance will track along the stalled front on Thursday night and Friday. Light snow is possible, but amounts look very little at this time. Not more than a dusting is expected. A strong cold front is expected to pass through about 3-4 AM Tuesday morning. (The front slowed down from earlier model runs.) Thunderstorms are expected to develop later this evening before the frontal passage. Strong winds follow the front tomorrow, as temperatures cool down slowly. Temperatures gradually fall tomorrow as the front moves off the coast slowly. A more interesting possibility is a possible snow this Friday. I'll update later.